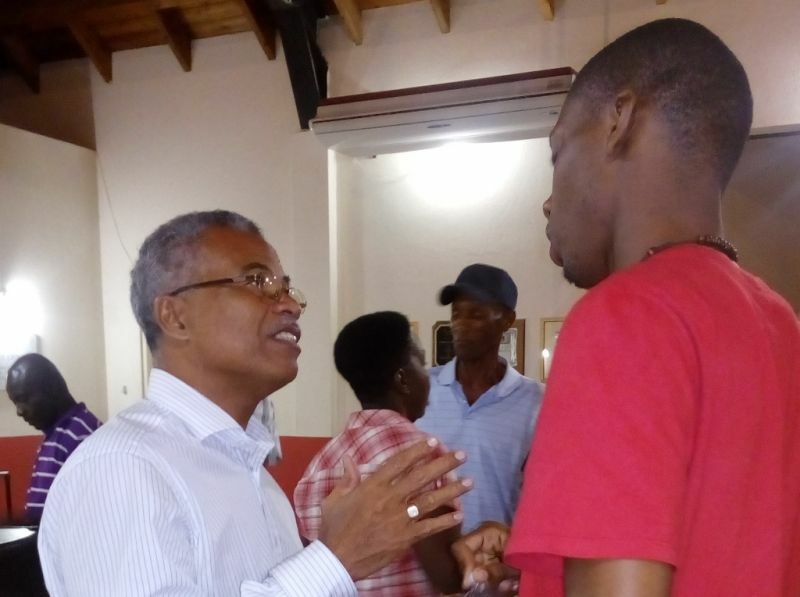 Hon O’Neal made the announcement at a public meeting geared at updating the people on the progress of work being done as well as plans for the district at the Catholic Community Centre in Virgin Gorda on the evening of Wednesday, November 9, 2016. According to him, this project will be a duplication of what is happening in Tortola where the Social Security Board (SSB) recently acquired property for the purpose of developing a housing scheme. He explained that he is working alongside the SSB for the mortgages. “The advantage we have is we have a lot of available Crown land, so individuals who have been given Crown grants, they can use that as collateral, they have a head start then,” he told this news site. The grants, he explained, are 99-year leases for house lots which are actually Crown lands but are leased to the people. He stated that “quite a number” of those Crown grants have already been distributed to people. The District Representative disclosed that the housing scheme will be built in a three to four-month time frame unlike the conventional way of six months and when complete will be able to withstand hurricanes and earthquakes. Hon O’Neal mentioned that the project will go on for years and will require the services of at least seven contractors and crews. “This project is going to go on for years because we have hundreds of lots vacant, so it means we have to build hundreds of homes,” he said. He urged residents to sign up to get their individual plots of land to get the project underway. To those who had applied and didn’t get a response from Government, they were told to submit their names and contact information so that it can be followed up on and placed at the top of the list. “There is enough Crown land in Virgin Gorda for every family to have a home and that is my aim to finally get you out of a rental property and into your own home,” he pledged. One lady asked whether they had the option of building their homes at their own pace, he responded that the option was available; however, it has to be at a certain standard so as not to devalue the other properties in the vicinity. The properties will cost in the region of $250,000-300,000 and will begin in the Copper Mine area. The housing development is targeting first-time homeowners. but he collected almost a million of NHI money in 40 though? @ Ralph fan club: yea; that should hold you(U keep talking while homeboy smiling alway the to the bank)..as grandmother use to say to me "leave that" cause one can only imagine who made What in those 40 years(U keep the fan club going and U keep the faith)...not everything good to talk!!!! Hope this is one of your solutions, wize up. Sorry, wize up. I should have used the term suggestions instead of solutions. I will be the first to give a Like on this suggestion, although, as you indicated, it might be a bit much to expect. But I still haven't given up on the good in man. If they are going to revise the constitution, I think that would be a good place to start building in checks and balances to safeguard the people's interest. We also need to cut back on this massive immigration influx. Just imagine out of 250 countries and territories in the world today, the BVI ranks 229 in terms of size but it ranks 36 in terms of population growth. This is not sustainable. Leaders need to see this. If they do, then, there is hope for us yet. O'Neal you should no better.. If fraser didn't wake him up we would've never hear a thing about biras creek, land, housing scheme and cargo dock. When these meetings does take place? I would like to attend. Just more virgin islands lands going to foreigners. We shouldn't be giving our land to all these so called belongers. That will be another NDP and VIP campaign slogan for next election. Housings and Mini Hospital for VG. We are so ignorant. We believe it every time.. More bluffing. just woke from his slumber but unfortunately for you Virgin Gordians he is still dreaming. Is Crown land for him to distribute? Where will he get the funds to start building your homes? Think about what he said "I am hoping to start it maybe towards the middle or towards the end of next year". everything went on VG. Give him a shack in Antarctica. This seems to be a hastily put together plot that is bring refined as the questions are asked. What happens to the descendants of these people when the land resorts back to the government after 99 years, will they have to repurchase the lease? SSB Money? Hmm. Is this man in a fantasy world? Switch party now if you want to retrain your seat. NDP don't stand a chance next election. Join that new party. Can't say you weren't warned. Well the firmer told me he just had rocks available and no more land to give so where have these emerge from.....I will be standing in line patiently for my children to see this unfold. That's nice and all, but what about the crown land that so many people applied for? Some of us can't make it to your VG office on the days you selected because we actually work in Tortola on such days.